The Industrial Analytical Center (IAC) is a commercial entity, under the auspices of the H.E.J Research Institute of Chemistry. The Industrial Analytical Center is offering a range of professional analytical and consultancy services to the industries, and other private and public sector organizations. Halal Testing Laboratory, Pharmaceutical Testing, Water and Chemical Testing, Microbial and Pesticide Testing, etc., Research method development, and analytical training are some of the core areas of Industrial Analytical Center strength. We are currently giving our best services to the industries, multi-national companies, manufacturers, and other similar associates. In response to the growing demand from industries, the H.E.J. Research Institute of Chemistry (University of Karachi) has established a world-class Industrial Analytical Center. This center was supported by the Ministry of Science and Technology, and Higher Education Commission. Prof. Dr. M. Iqbal Choudhary is the Director of IAC since its inception. This center is now helping a large number of industries to analyze and demonstrate the quality of their products, and check the authenticity of their raw material. The Industrial Analytical Centre also provides world class trainings on analytical instruments and Proficiency Testing services. To achieve excellence and recognition by providing highest quality industrial analytical and consultancy services. To become the benchmark in industrial analytical services by providing access to cutting edge analytical and R&D services. 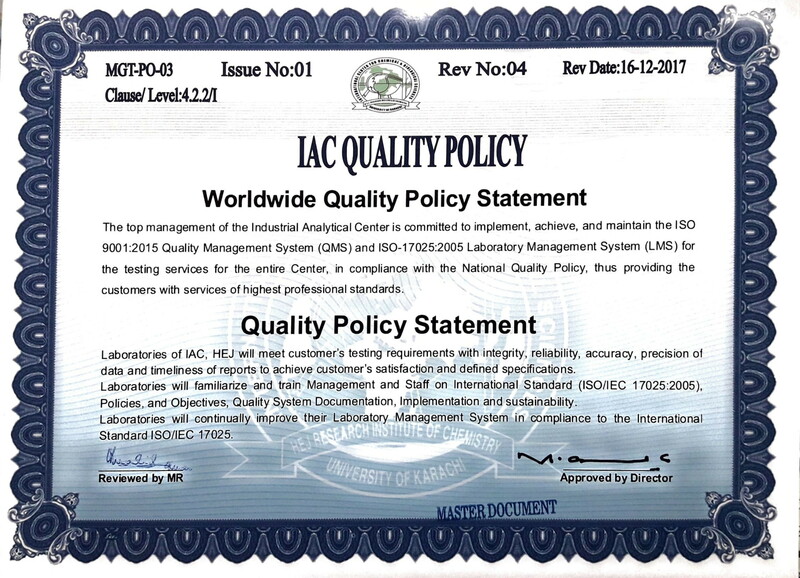 The top management of the Industrial Analytical Center is committed to implement, achieve, and maintain the ISO 9001:2015 Quality Management System (QMS) and ISO-17025:2005 Laboratory Management System (LMS) for the testing services for the entire center, in compliance with the National Quality Policy. It thus provides the customers with services of the highest professional standards. a) Fruits, vegetables and sea food analysis, e.g. dairy products, rice, pulses, cereals, wheat, etc. b) Analysis of trace elements in water, soil and other samples. c) Analysis of residual pesticide in agricultural-based samples. d) Petroleum products, lubricants oil, crude oil, kerosene, etc. e) Pharmaceutical finish goods and raw material analysis.  f) Agriculture product e.g. fertilizer, micro nutrients etc. g) Material testing such as polymer, plastics and dyes. h) Standardization of herbal medicines / products. i) Environmental analysis like bod, cod, etc. 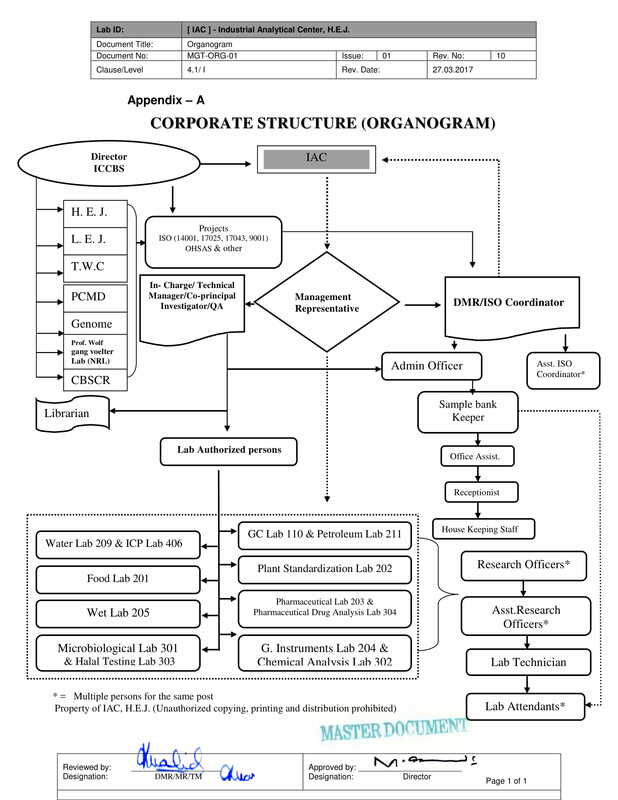 j) Microbiological and toxicological analysis. k) Organic / inorganic chemical analysis. l) Analysis of cosmetics and botanicals. Testing of material and finished products is conducted following the compendia or client supplied procedures, it has also developed customized analytical procedures for the analysis of the rarest substances for which no protocols are available. In addition to the analytical services, the center also takes challenging assignments for developing technologies for indigenous manufacturing of new materials, and product improvement to meet the customer's demands. We also provide other expertise, including method development and validation, scientific literature survey and industrial informatics. All IAC staff is fully aware of the Quality System operated within the institution, and is therefore committed to provide services in keeping with the international standards. IAC has acquired the services of experienced analysts and researchers with expertise in chemical analysis, microbiological testing, food science, biotechnology, and pharmacology. Most of them hold Ph.D. or Master degrees in relevant fields with extensive industrial experience and international trainings. The IAC staff is committed to provide professional services to the clients by using the most valid, reliable, and sophisticated technologies available today. The entire staff of the IAC endeavors to achieve the highest level of customer satisfaction, and continual improvement of the services by meeting the requirements of the Quality System for the technical services, and ISO 9001 for Quality Management, ISO 17025 for Laboratory Management, and ISO 17043 for Proficiency Testing Provider. The laboratories of IAC, HEJ, meet customer’s testing requirements with integrity, reliability, accuracy, precision of data, and timeliness of reports to achieve customer’s satisfaction and defined specifications. 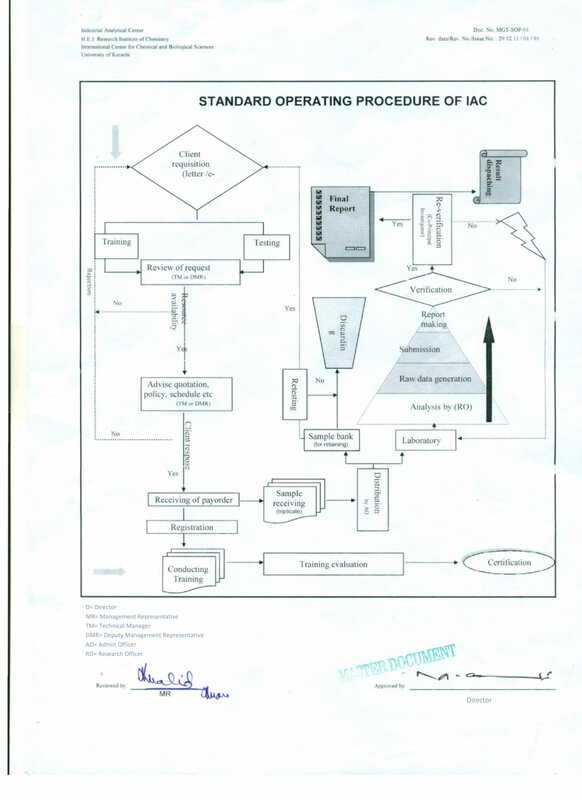 The laboratories will familiarize and train management and staff in International Standard (ISO/IEC 17025:2005), policies and objectives, quality system documentation, implementation and sustainability. The laboratories will continually improve their Laboratory Management System in compliance with the International Standard ISO/IEC 17025. The laboratories will provide proficiency program on different testing matrices on the basis of different test parameters to improve their Laboratory Management System in compliance with the International Standard ISO/IEC 17043. Address: Industrial Analytical Center (IAC), H.E.J. Research Institute of Chemistry, International Center for Chemical and Biological Sciences, University of Karachi, Karachi-75270, Pakistan.